Bring a bit of island fun to your next get together with Andrew Iannazzi's handmade glasses. 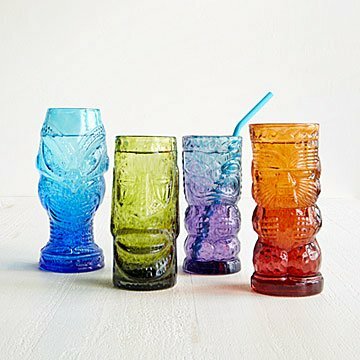 A successful luau should include: Grass skirts, a ukulele, these tiki glasses. While you work on the outfit and music, we'll handle the glasses. These beautiful designs bring a Hawaiian touch to your next party or just dinner with friends. Andrew Iannazzi handcrafts each unique piece, melting bits of colored glass into four different tiki mask molds. Give the set of four to your favorite hostess so they can make every party a tropical getaway. Handmade in Cambridge, Massachusetts. "My main interest in glassblowing is to create timeless design and iconic form language." Andrew Iannazzi is interested in iconic design language and imagery. He draws from historical Italian and Scandinavian design as well as American popular imagery. Glassblowing is the perfect medium for the investigation of these issues. Iannazzi uses his objects to explore functionality, form, and iconic representations. Iannazzi uses off-hand blowing and traditional mold-blowing techniques. Iannazzi began glassblowing at Hartwick College in Oneonta, New York. He has since worked in numerous professional glassblowing facilities throughout the United States.